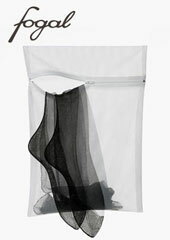 Fogal's tights are often called the finest in the world, so naturally they use only the finest fabrics available. Silk has become one of the most popular materials for high end legwear designers because of its beautiful sheen and its unrivalled softness, but it can be notoriously difficult to find a good fit. Fogal have used their experience as master designers to find the perfect balance of fabrics, giving these gorgeous tights a little stretch so they'll fit beautifully. These are one of the most exquisite and luxurious tights designs we've ever had the pleasure of hosting and they're a testament to Fogal's talent.